Arena of nanotechnology has revolutionized the field of bioremediation to overcome the problems of environmental pollutions. Approaches applied for the monitoring and treatment of contaminants includes control of pollutants, sensing the pollutants and remediation by nanoparticles. Among the three approaches, the most important is to remediate the pollutants. 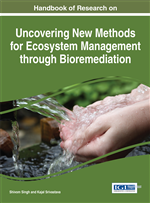 This chapter highlights the eco-friendly, accurate, cost effective, ex-situ and sustainable approach for the “Green Bioremediation” with the help of nanoparticles. Nanoparticles covers the treatment of surface water, groundwater and industrial wastewater contaminated by toxic metal ions, radionuclides, organic and inorganic solutes and also reduce aromatic recalcitrant compounds from soil and air pollution. There is also a scope of enhancing the remediation potential of nanoparticles by manipulating size and geometry. They have given a new hope towards positive sustainable approach for environment and human welfare. Increment in the population density, necessity of up gradation in agriculture productivity, industrialization and urbanization of human societies are accountable for environmental contamination (Figure 1). The extensive use of anthropogenic materials contaminates the natural ecosystem which degrades the environment in long term by several means such as loss in biodiversity, introducing heavy metals and other organic recalcitrant compounds. On this regard decontamination of these hazardous wastes via eco friendly approaches is an enigma. In the diverse biological species present in nature, many are blessed with the ability to tolerate heavy metals. Progress in science and technology facilitate us to concern the ability of biological diversity for depletion of pollution which is termed as bioremediation. This is promising efficient novel technology for dealing with extensive range of contaminants. This technology mediates phytoremediation (plants), rhizoremediation (plant and microbe interaction) and remediation via biosynthesis of nanoparticles (nanoparticles synthesized by microbes). Currently maintaining ecosystem and biodiversity has become an increasingly important field of research, as well as a resource management goal. Various industrial chemicals are released daily which are hazardous to the environment and cause harmful effects to the biodiversity by entering the food chain. These chemicals include petroleum hydrocarbon, heavy metals, phenolic compounds, metalloids, radionuclide, effluents and halogenated solvents from industrial sources, explosives, agricultural chemicals. Common contaminants and their health hazards: Polyaromatic Hydrocarbon: Carcinogen, mutagen, single ring compound does not have carcinogen property but after fusion they become carcinogen. Chlorinated hydrocarbon: Easily dissolved in water, mainly affects the respiratory tract, non carcinogenic, causes irritation in eyes. Phenols: Irritating and corrosive effect on skin and become chronic by affecting central nervous system and kidneys. Lead Exposure: Toxic blood, neurotoxic effect of lead at lower levels. Chromium Exposure: Epigastric pain, nausea, diarrhea, chronic ulcer. Major part of biosphere which is contaminated with anthropogenic substances is soil and water. Soil, the most important land constituent is contaminated with chlorinated compounds, polycyclic aromatic hydrocarbon, heavy metals and radionuclides (Acevedo et al., 2010). These contaminants sequestered in saturated and unsaturated layer of the soil which underlying between the ground surface and groundwater level. Consequently, sites can have a high concentration of organic contaminants in soil layers in addition to possible groundwater contamination. They can cause detrimental effect on the flora and fauna of affected habitats through uptake and accumulation in food chains, and in some instances, pose serious health problems and or genetic defects in humans. Water is mainly contaminated by chlorinated hydrocarbon, heavy metals, chlorine compound like Trichloroethene (TCE) and Polychlorinated biphenyls or mixtures of anthropogenic organic chlorinated compounds (He, F) which is highly reactive and water soluble(Arjoon, Olaniran, & Pillay, 2013). These compounds are carcinogenic and naturally non degradable, so it persists in water and soil for long time and become a challenge to remediate these compounds (Figure 2). Photocatalysis: Oxidation/reduction or breakdown the compounds in the presence of light. Example: titanium dioxide nanoparticle. Green Technology: It’s a continuously involving a technique for the non toxic, sustainable production of products for promoting the viability and innovative effect in the environment. Nanoremediation: Use of nanoparticles for cleaning or remediate the contaminants and waste product. Secondary Metabolites: These are the organic compounds that are not essential for metabolic processes of microbes/plants, although it enhance the growth and development. Rhizoremediation: This remediation is performed by means of interaction of soil and microbes and plants. The most active region for the remediation of soil contaminants is near the roots of the plants. Zerovalent Iron: Zerovalent iron is granular form of iron, has reducing and absorption property used in remediation of chlorinated compounds. Biomass: Residue of living material present in soil and environment. Native Microflora: Microbes which are present in their originated place and where they balance the physiology of the environment.